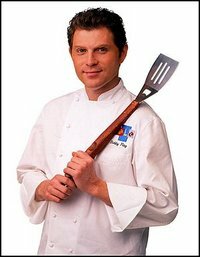 Bobby Flay (born October 9, 1964) is an American celebrity chef and restaurateur who has also became a super chef. He is the owner and executive chef of four restaurants: Mesa Grill, Bolo and Bar Americain in New York City, and Mesa Grill Las Vegas. Flay also hosts three Food Network television programs, and appears regularly on a fourth. He married actress Stephanie March on February 20, 2005. Flay got his start at age 17 in Joe Allen's New York City restaurant. Owner Allen was so impressed by Flay's talents that he personally paid for his tuition to the French Culinary Institute. Though he earned the first Outstanding Graduate Award from the school later in 1993, Flay did not take to French cooking. He later developed his own style of American southwestern food incorporating ingredients introduced to him by Jonathan Waxman such as chiles, avocados, and beans. From 1988 to 1990, Flay worked as the executive chef at the Miracle Grill and caught the attention of Jerome Kretchmer. In 1991, Kretchmer offered Flay the opportunity to open Mesa Grill in New York City. After reaching critical acclaim, Flay again teamed with Kretchmer in 1993 to open Bolo only a few blocks away from Mesa Grill. Bolo continues to be voted the best Spanish restaurant in New York City by the Zagat Survey. That same year, Flay was voted the James Beard Foundation's Rising Star Chef of the Year. In 2004 he opened another Mesa Grill at Caesar's Palace in Las Vegas. He has authored several cookbooks, including Bobby Flay's Bold American Food (1994), From My Kitchen to Your Table (1998), and Boy Meets Grill (1999). His latest book, Boy Gets Grill, was released in 2005. He is also an Iron Chef on the show Iron Chef America. Flay has had a controversial history with the original Japanese Iron Chef show. In 2000, when the show traveled to New York for a special battle, he challenged Iron Chef Masaharu Morimoto for Battle Rock Crab. After cutting his finger, he suffered an electric shock from faulty wiring in the makeshift Kitchen Stadium in New York. After the hour battle ended, Flay stood up on top of his cutting board and made the "raise the roof" gesture with the cheering audience. Not realizing that all cooking instruments are sacred in Japan, he greatly angered Iron Chef Morimoto who criticized his professionalism, saying that Flay was "not a chef". After all this, Flay lost the battle, but the rivalry between him and Morimoto had just begun. Flay challenged Morimoto to a rematch in Morimoto's native Japan. In this battle, at the end of the hour, Flay threw his cutting board across the room and stood on the counter yet again to raise the roof with the audience. This time, Flay won. Though they share a heated past, Flay and Morimoto, who are both Iron Chefs on Iron Chef America, are now friends. Flay also starred in the Disney Channel Original movie Eddies Million Dollar Cook Off! Flay hates lentils. "An early draft of Bar Americain's menu had a beet and goat cheese salad with lentils, but Mr. Flay rejected it before the restaurant opened. 'When I go on vacation, they run specials on lentils,' he said." Flay guest starred on an episode of Law and Order: Special Victims Unit where his character was rectally violated with a cattle prod.